Solar panels on the roof and fixed shading on the windows suggest that this is no ordinary wood-shingled house. 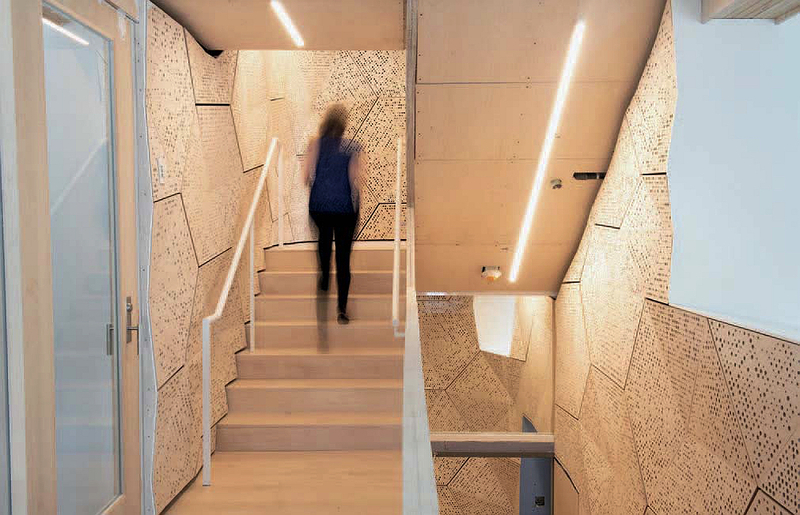 HouseZero’s front entrance opens to a central staircase lined with acoustic, sound-deadening panels designed at the Graduate School of Design especially for this project. At right is the first floor’s main workspace. It’s machine learning for houses: sensors connect to a “brain” that constantly optimizes the environment. Visit the CGBC website . 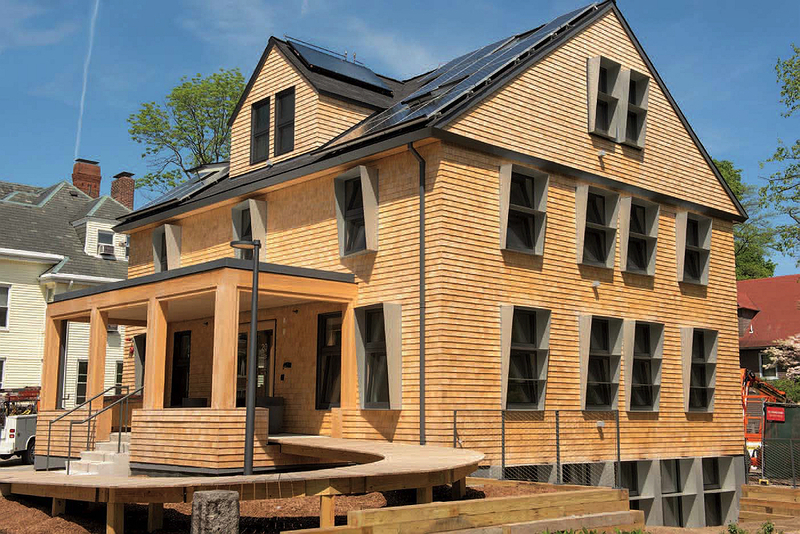 HouseZero, as the wood-shingled building at 20 Sumner Road in Cambridge is now called, owes the moniker to its efficiency: zero carbon emissions, zero electricity required from the grid, zero electric lighting needed during daylight hours, and zero fossil-fuel-driven heating and cooling. That combination makes this building, which doubles as headquarters for the Center for Green Buildings and Cities  (CGBC), a unique example of sustainable retrofitting. But what really sets this sustainability project apart is that the house (now converted to office space for 25 CGBC staff members and researchers) is an expensive test facility—a laboratory—not a model home. 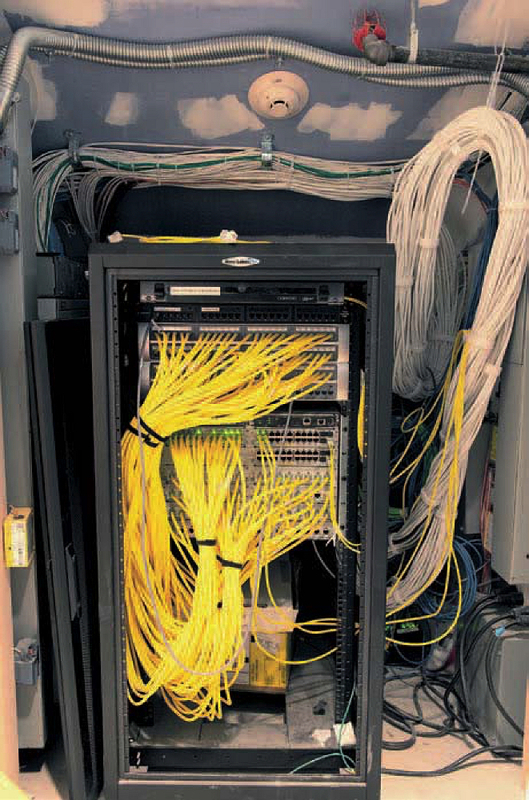 Nearly five miles of wiring capture 17 million data points per day to quantify how each of the innovations used in the reconstruction work best. The data flow from two types of sensors. Some are critical to the operation of the building: for example, controlling the system of windows and shades in response to inputs about temperature, rain, wind direction, and indoor CO2 levels and airflows. 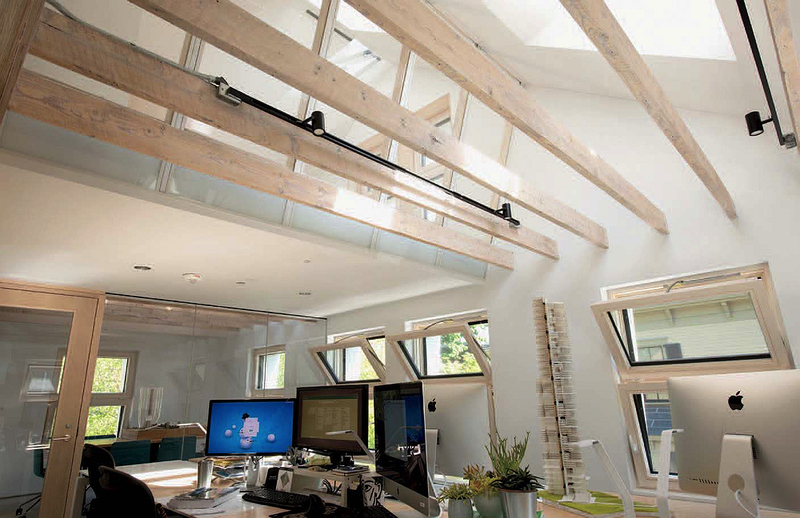 Other sensors, purely observational, are intended to generate insights into optimizing the relationship between indoors and outdoors, while maximizing the health and comfort of the building’s occupants. The Graduate School of Design’s HouseZero, envisioned as an antidote to this trend, aims to run entirely without such conventional systems. To help achieve this, many tons of concrete mass were added in the floors between stories during its renovation, as heat sinks to stabilize daily temperatures from night to day, and seasonally across frigid winters and scorching summers; fixed shading was added to window exteriors; and the existing windows were replaced with new ones that open and close automatically, as directed by a controlling algorithm running on the house’s “brain” (a basement computer capable even of integrating weather predictions so the building can prepare for temperature extremes in advance). In summer, for example, the windows, which operate on very little electricity, open at night to cool the space whenever there is a temperature drop of 10 degrees or more, and then close before people arrive in the morning. Basement batteries store power from the photovoltaics on the roof, so the building is expected to cost almost nothing to operate. “The idea,” Malkawi says, “is to move away from a mechanical-engineering-dominated world in buildings to this ecological approach.” As such, the retrofitted house is a test site for the center’s research mission. To enable researchers to investigate the relative importance of various technologies in the smooth operation of the house, the building has redundant systems such as geothermal heating and cooling equipment in the basement and solar thermal heating apparatus on the roof. Malkawi’s aim is to use neither, if possible. Failing that, the fallback (for example, in winter) will be solar thermal heat; geothermal is a distant third option. The main research questions, he adds, have nothing do with the specific energy-generation technologies used, because those change and “can be put on and off like a jacket.” He wants to know whether an algorithmically controlled building can optimize itself. How would complex building data be used to develop such algorithms? What is the minimum number of sensors needed? And can this approach be deployed at scale? For more information on the CGBC, see harvardmag.com/cgbc-14 .